A builder's firewall is almost like his panel... a blank canvas for you to create and organize on. No two firewalls will be the same. The scene behind the firewall with the baggage floor removed. 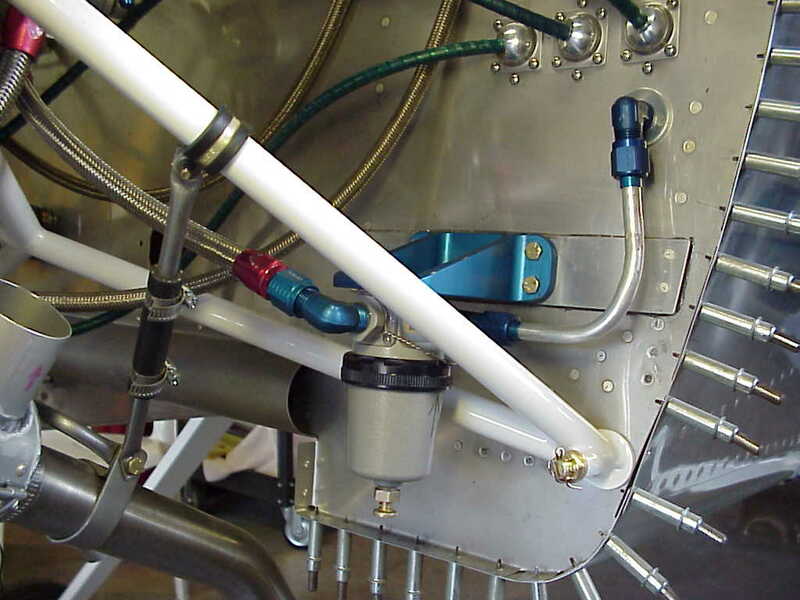 Note the different method of routing the low pressure brake lines. I didn't like the way the plans call for them to loop aft of the bulkhead. This would also have interfered with the parking brake valve I installed. 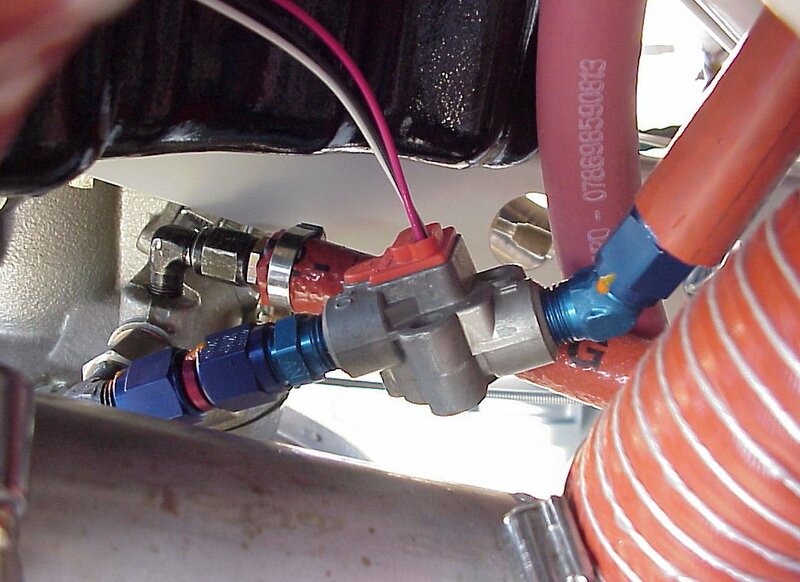 UPDATE: check the Ideas & Products page for a better way of supplying brake fluid... all those chronically leaking low pressure tubes have now been eliminated. Work in progress. Note the Van's transducer manifold in the upper right. Hoses below it are just taped in position for now. Finished transducer manifold installation. Oil pressure is on the left, manifold pressure in the center, and fuel pressure on the right. 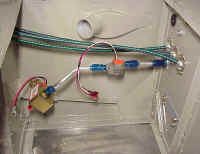 The unused tap on the fuel pressure partition will be used as a source of fuel for the electric primer circuit when I get to it. Big picture from the right & left sides. 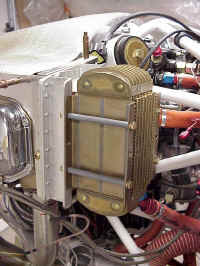 The electric fuel primer circuit is still not installed yet but will be visible on the left side. 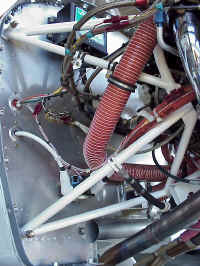 Detail of the four blast tubes exiting the top rear of the cooling plenum. They go the left/right mags, fuel pump, and gascolator. Quick drain in action at the first oil change. Note the oil breather adjacent to the left exhaust pipe and the new style Vetterman exhaust mount system. Oil cooler installation. This is the "Stewart Warner style" cooler sold by Van's that is actually made by Niagara. On hot ambient temperature days my oil temps are a bit hotter than I'd like so I continued to experiment with different oil coolers, see below. Since flying my RV-8 (four months ago) my oil temps were a bit higher than I'd like on days where the ambient temp is 80 or above. When it is above 90 they were definitely too high (like 218 at low altitude low power cruise). On one 90+ degree day in Central Oregon departing from a 5,000 elevation airport with the engine already hot, and while following another plane's climb profile, I saw 245... yikes! Since then I've learned to manage oil temps and have never seen over 230 regardless of the ambient temp. Still, I did not feel like I had adequate headroom. 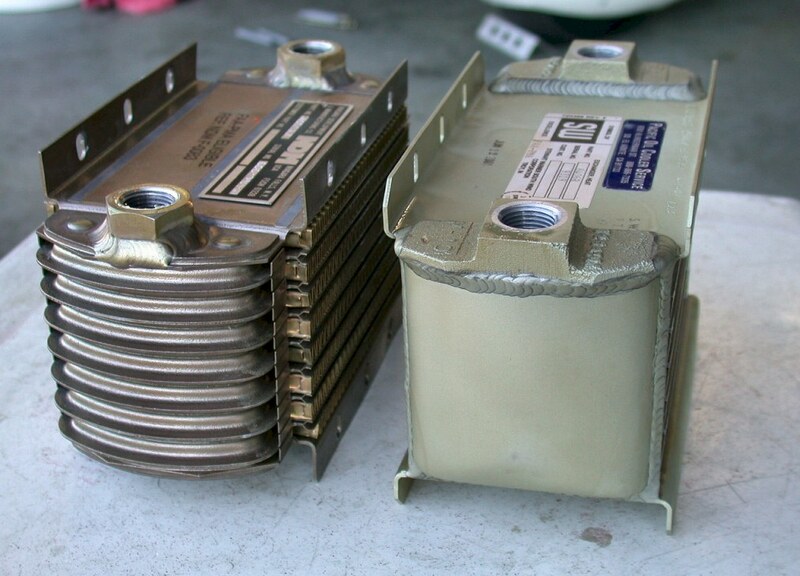 Several RV List contributors had spoken with Pacific Oil Coolers lately and been advised that Stewart Warner coolers were the most efficient, so I called them also to see if a swap with my Niagara would lower my temps. They told me "absolutely" and that I "could possibly see a 20% reduction". Of course they wouldn't guarantee anything. Frankly I simply didn't believe the 20%, but I'd be happy with 10-15 degrees (5-8%). When doing my final FWF installation I had originally bought a Posi Tech. Solely on the experience of several RV-Listers I sold it and bought a Niagara from Van's. At that time I thought the Niagara was the identical product to a SW... ignorance is bliss. Again, the Niagara has worked well for 120 hours for all but very high ambient conditions, which is only a problem here in the Great Northwest for 2-3 months a year. If you lived in Arizona or Florida it wouldn't have been unacceptable. Curiosity got the better of me so I ordered one and swapped the SW for the Niagara while doing an oil change. 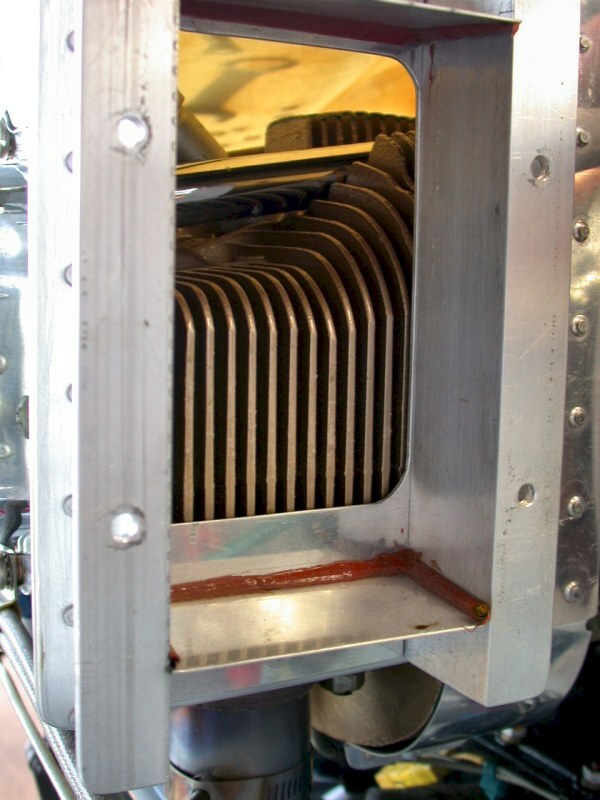 The flanges and bolt hole dimensions are identical, but the core is recessed about 1/4" deeper than Niagara. This required a very minor modification on my mount... no problem. 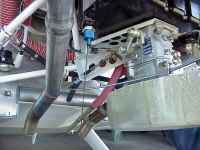 I ground ran it as usual when doing an oil change to look for leaks, none noted, and buttoned it up to be flown the next morning. I have now flown 7.5 hours over the last two days in ambient conditions of around 80 degrees on the ground. The comparisons I made are not good scientific method, rather my own feel for what temps would have been before versus what I was seeing now. After flying the plane 120 hours in the last four months though I feel like I have a good handle on what was normal for a given flight condition. Sorry, proper data would have been tough to get (identical ambient conditions combined with identical climb/power profiles) and way too much work. So here's what I found: when doing an extended climb before at 120-130 mph on days like this I would see peaks of around 220-225. This weekend I saw peaks of 205-215. Cruise at 7,500-8,500 feet, with the power settings I typically run, before would typically be 189-202, this weekend they were 182-185. 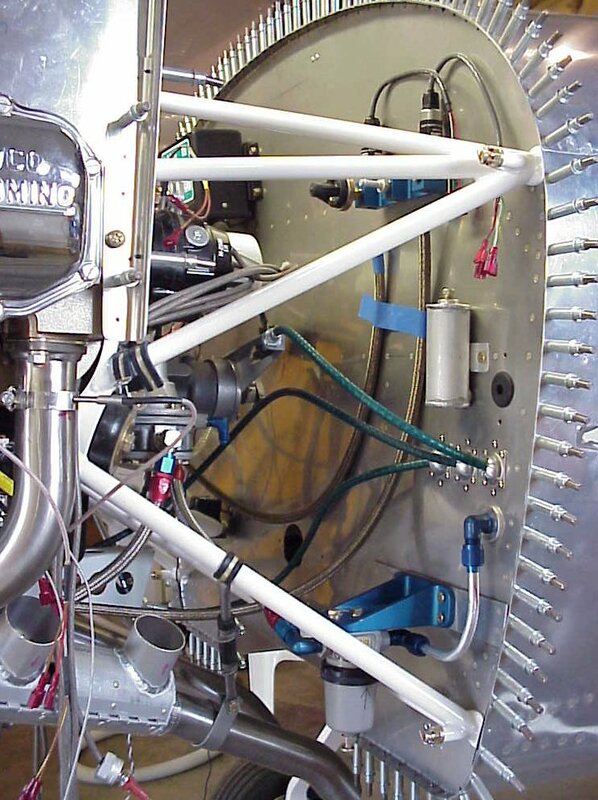 During long high-speed descents temp would never drop below 180 with either cooler so the vernatherm must be working. When assessing this information it should be noted that my plane is non-standard and may make the oil cooler's job a bit tougher. I have a Sam James closed cooling plenum. This forces you to mount the oil cooler lower behind cylinder #4 than with Van's standard baffles, hence half the cooler inlet is cylinder fins. 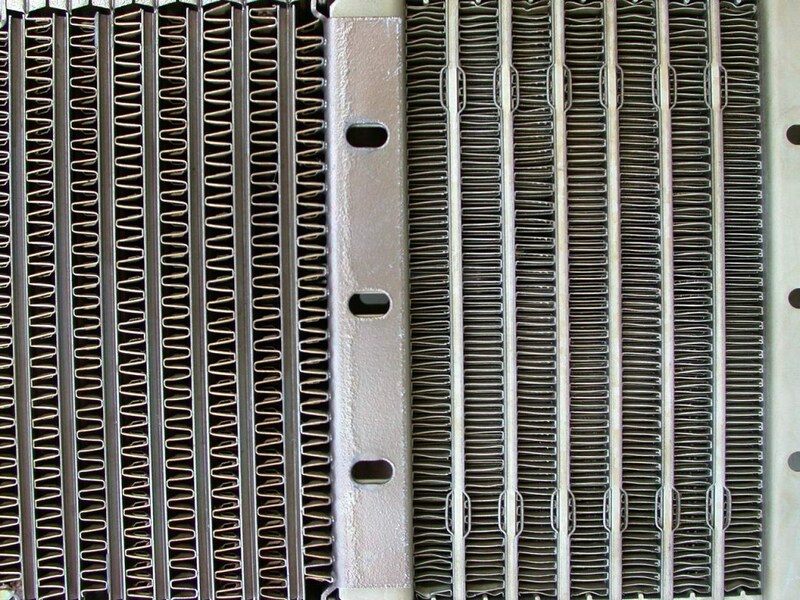 This probably impedes airflow and also may pre-warm the air, not good for cooling. Hmm, what conclusions can we draw from this? My own sense is that the SW does indeed cool *just a bit* more effectively than the Niagara. In fact my own belief is that I'm seeing an 8-10 degree reduction. The Niagara is $241 from Van's, the SW was $397 outright from Pacific Oil Coolers. Was the swap worth it? In the long run, probably. Was it dramatic? No. Will I keep the SW installed? Yes, that 8-10 degrees is important on those hot days. So there you have it, as close a comparison as I can give you. 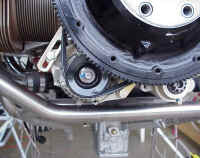 Unlike some finished planes I've seen, I want to be able to drain my gascolator before every flight. This required some special engineering, and mostly some quality time in the machine shop. Buddy and fellow builder Randy Griffin made this work of art, and even had it anodized blue for me. It allowed us to locate the gascolator in the perfect position to be accessed for draining via a 1" hole in the bottom of the cowl. Note the reinforcements it's mounted to. 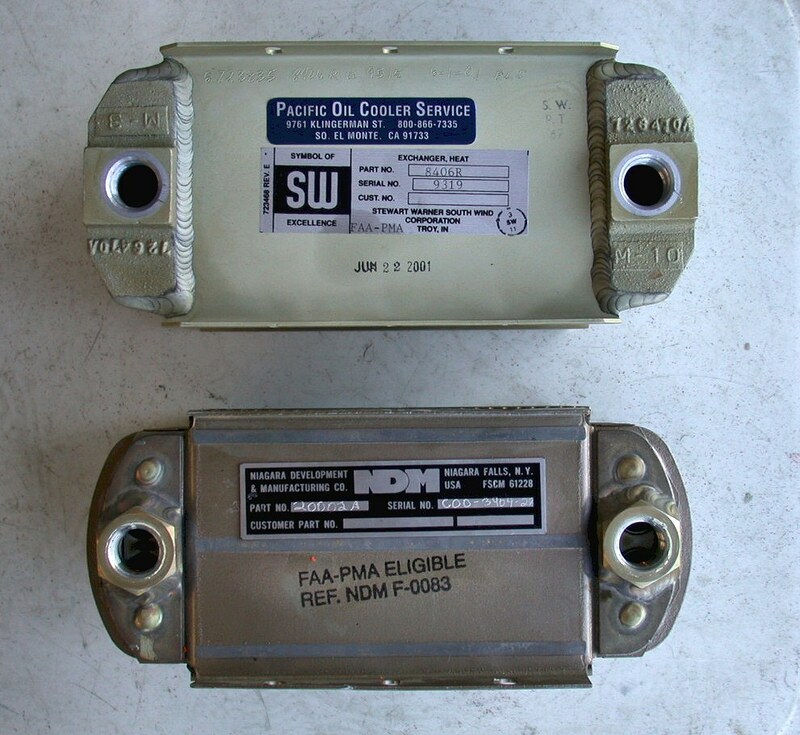 These are riveted to the firewall angles, and there is also an .063" plate on the back... don't want that sucker vibratin! Many builder's have asked if Randy Griffin would make more of these for sale. Randy says that it's just not economically feasible. 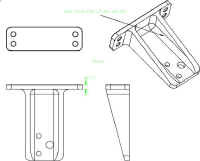 He has however provided the part drawing as a .dxf file. 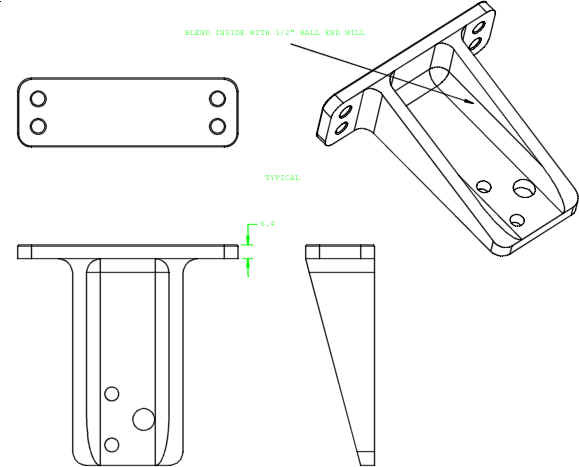 You could take this file to your local machine shop, and with CAD equipment they should be able to reproduce it. There are many versions of the basic Marvel Schebler carburetor, and mine had a 1/4" NPT outlet on the inlet boss... perfect as a take-off for my fuel pressure gauge. That way I'll know exactly what pressure is being delivered to my carburetor. If you mount it further upstream you could get a clog and the gauge would not reflect it. The aluminum AN822 fittings you see here were subsequently changed to steel. 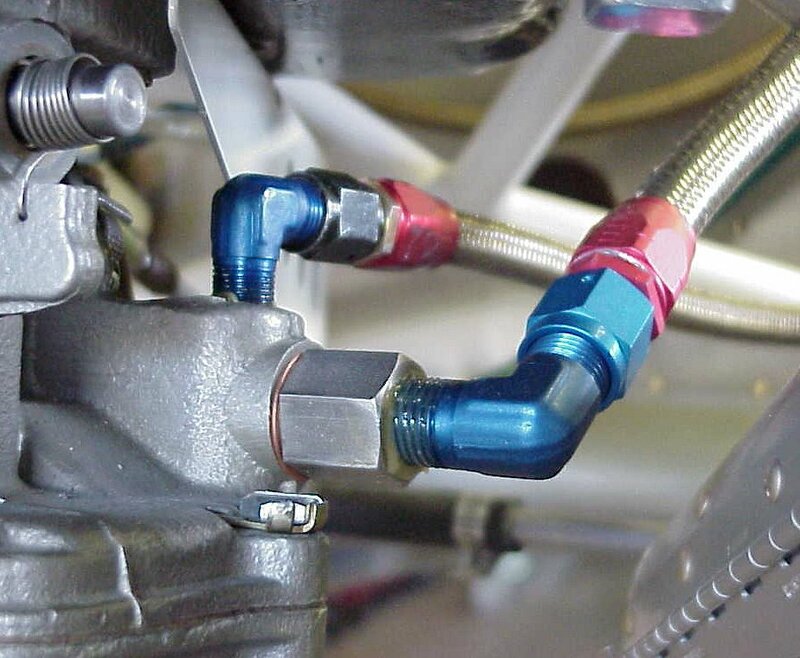 After hearing stories of aluminum AN fittings failing when used on the engine I decided to use STEEL AN fittings whenever anything went into the engine. I've still used aluminum everywhere else. These darned Lycomings vibrate like crazy, and I just didn't want a failure here — hot fuel spilling on your hot exhaust is not good. 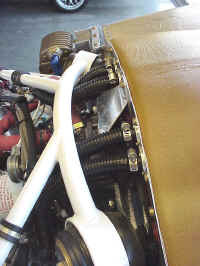 Details of my FAB (filtered air box) and carb heat cable installation. 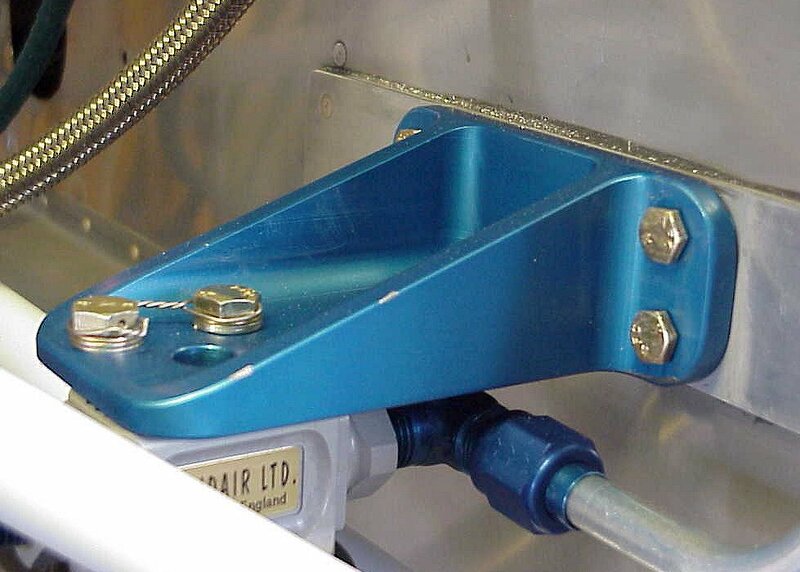 I elevated the cable clamp to provide the correct angle of operation, and I also drilled holes closer to the pivot on the arm to provide for less cable travel. 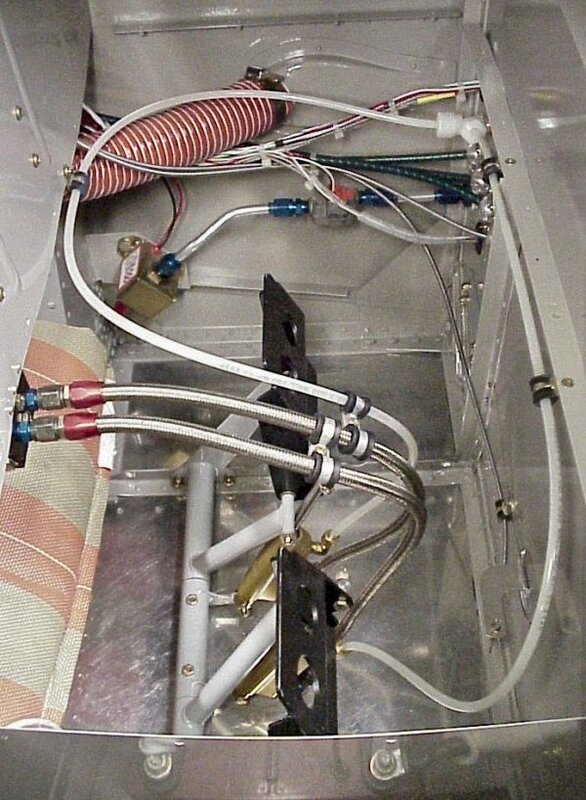 The hole being used seems to provide a good compromise between enough leverage and reasonable cable travel in the cockpit. 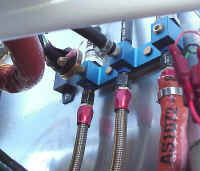 I first fit the fuel flow sensor you see here into a line up front... wouldn't go. 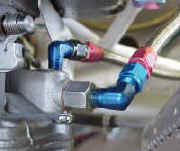 The fittings on the Aeroquip line, combined with the AN fittings on the sensor, made it too long. 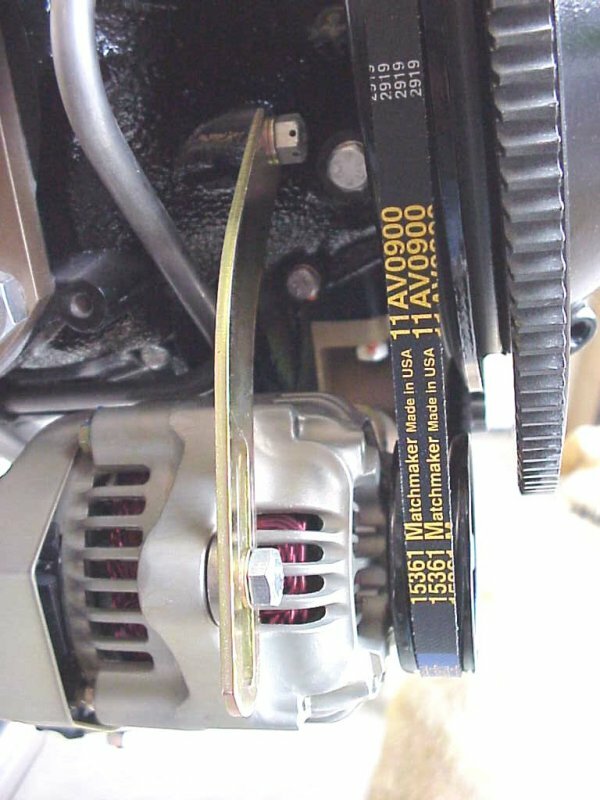 There have been reports of fuel flow gauges displaying inaccurate readings caused by the pulses generated by the Facet auxiliary pump when mounted too close like this. I am using an Electronics International FP-5 fuel analyzer and the E.I. folks tell me that it has circuitry built in to filter these pulses out. It will be simple to tell - watch the fuel flow and then turn on the aux pump... we'll see. Turns out the E.I. FP-5 fuel flow gauge does NOT properly filter out the pulses from the aux fuel pump — once flying I was getting erroneously high flow readings with the aux pump on. I was concerned because this would in turn lead to incorrect "fuel consumed" readings. E.I. admitted I was given bad information on that issue originally, and the source of this information is no longer with the company. 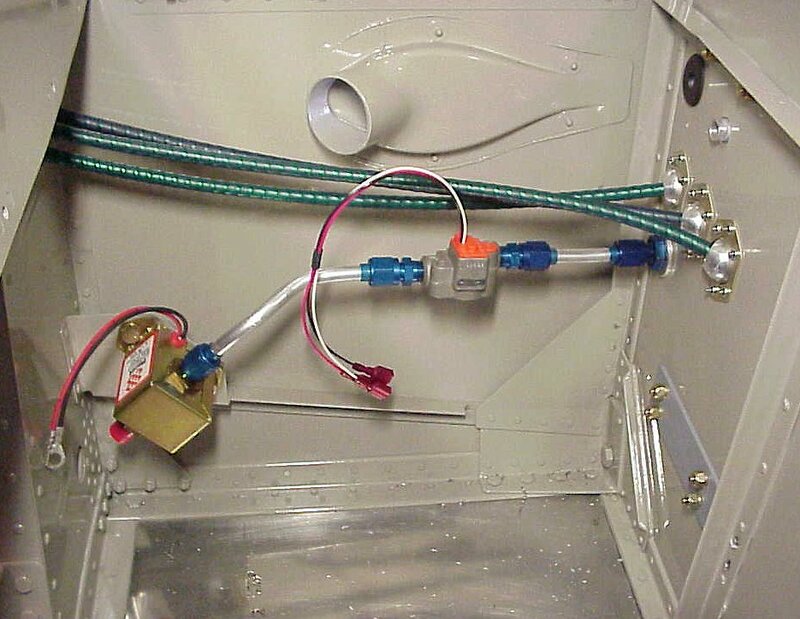 Both in their installation manual and on the phone they insist that the flow sender needs to be AFTER all fuel pumps to avoid a vacuum on the sender at any time. There's only two ways to do this, at least in a carburetor installation. One, mount it inline between the engine driven fuel pump and the carb, or two, mount it on the firewall and run long lengths of flex line from the fuel pump to the sender, then from the sender to the carb. While at a local aircraft part store I found a special AN fitting allowing me to hard-mount the sender to the carb. This installation yields even larger errors. At the same K-factor setting the flow readings are probably 40% too high. Then when I turn on the aux pump they actually go down. Go figure. After flying with it this way for a couple of weeks I felt it was more accurate in the original configuration. I next relocated it back behind the firewall, but used my special hard coupling to mount it directly to the back side of the firewall thereby leaving an even longer straight tube from the Facet pump to the flow sensor. I've flown many tanks of fuel since then and even though the flow does indeed jump up 2-3 gph when the aux pump is on, the accuracy is impressive. After a few tanks to get the k-factor adjusted properly the all-important actual "fuel remaining" calculation now yields an error of .2-.5 gallons when I fill up... good enough for me. Frankly I don't understand how it can be so accurate when the boost pump throws it off so much, but there is no denying the accuracy. If you spent a whole tank in the pattern with the pump on I suspect it would throw it off, but for normal RV flying I have come to trust this computation as the true reflection of how much fuel I have left. The regular fuel gauge works pretty well also, but of course is completely inaccurate when the plane is on the ground in the three-point attitude. If I want to know how much fuel is in it I just flip on the master and the FP-5 defaults to the "fuel remaining" screen... voila, I know instantly how much fuel is left and can plan accordingly. Additional factoids: E.I. uses a Floscan 201 flow transducer which seems to be the standard of the industry. I understand Vision Microsystems uses the same sensor as does Matronics and JPI. The 201 is for low wing aircraft and has a smaller orifice for the fuel to flow through, but it has greater resolution in that it breaks a gallon of fuel into something like 8,500 pulses. They also offer another sensor with a larger orifice (205? ), but it has lower resolution and may be slightly less accurate. The reason all of these instrument manufacturers instruct you to mount the sensor downstream of ALL pumps is to avoid a vacuum condition. 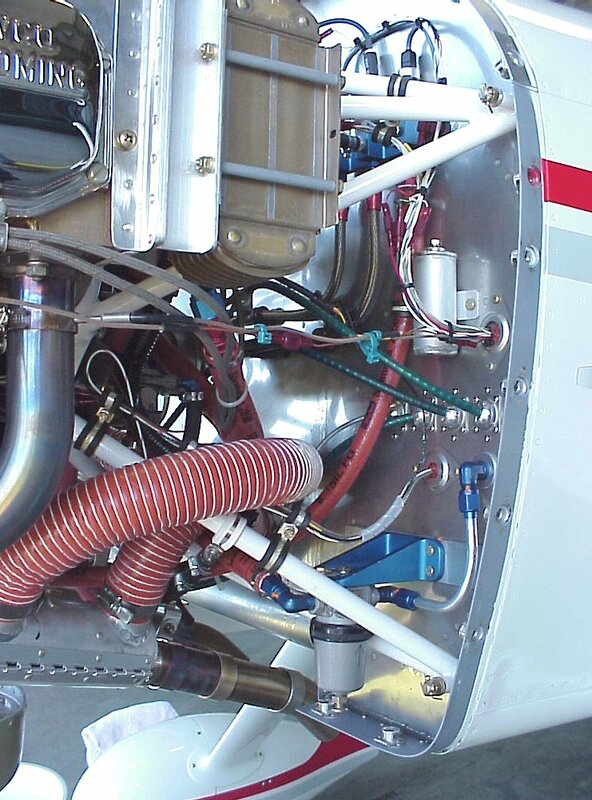 Apparently it is possible for avgas to be separated into a "benzene state", and they want to avoid that under all conditions. Frankly, I think that in the low pressure carburetor installations this is just about impossible. Anyway, these instructions come from Floscan and I'm sure are driven a bit by liability concerns. To the their credit, Dave Campbell at E.I. has been very helpful and attentive through this process. I continue to have confidence in both my E.I. instruments and the company.